Most online casinos trying to offer the best casino bonuses in the market to attract new players to their casino. These bonuses made is easy for players to abuse them, resulting in strict bonus terms for everybody accepting bonus offers. At No Bonus Casino, a brand launched in 2013 under the Malta jurisdiction, you won’t have any problems with strange bonus terms. You just get your cash back of 10% the day after playing your money away, no strings attached! With their casino games offered by Net Entertainment, the world leader in creating gambling software, and their live casino offered from 2 reel casinos in Malta this platform offers more than enough choice for the average player. 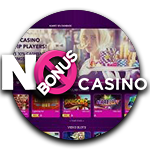 In the footer of the No bonus casino website there is some more information for grab. You can find the Yggdrasil and Amatic logo, two leading gaming providers that are not added to their platfor yet. It would not surprise me if the L&L Europe group will soon be offering these games as well. There are a lot of players playing like me, not accepting bonuses due to bonus terms different at each casino you play. Especially players liking a game of roulette or blackjack simply never want to make use of bonuses and do not get rewarded for their game play. 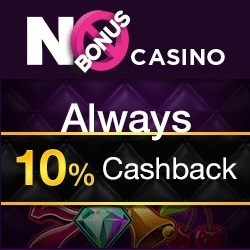 At No Bonus Casino every single player is a VIP by receiving 5% of their losses back in cold hard cash! They can’t make it more simple then that. But 5% is more than the house edge a gambler would say and that is absolutely correct. If played wisely you would make a profit at this online casino. As gambling is mostly not a game that’s played wisely it’s a win – win situation for No Bonus Casino, unless you try to beat their system! It’s easy to make a perfect example how to make a profit at No Bonus Casino with the odds in your favour. An easy example can be made on the roulette table. Imagine this very reasonable calculation: On day 1 the player bets 500 on red, loses it all, a cash back of 25 will be provided to the players No Bonus account the next day. 475 is deposited the next day and another 500 bet is made, 25 euro is already there as cash back. Winning this spin is resulting in a 1000 euro balance and 25 euro profit for the player. Is this profitable on the long term? Yes it is. As 5% in cold hard cash has more value then the 2.7% house edge on the roulette table. On the long term you would make 2.3% profit in case you would use this technique. Imagine you do this tric every day for a full year and you have averaged your payout. In that case you would have 182 times 25 euro profit = about 5000 euro. You can also double or even triple this amount, the choice is all yours! The question is, will they change their terms for your account in case they see that you are beating their no bonus casino system?! Hopefully you will not have to use the support function too often if everything works like it should. In case you have any questions for the No Bonus Casino support you can do that in multiple languages. They offer full Dutch, Swedish, English and Maltese customer support for all players. Just ask on the live chat for it that’s open 365 days per year between 9AM and 1AM. One thing I found out is that the VIP support, as that’s how they call themselves, is well educated in online gambling. I get the idea that all support agents gamble their selves as well what makes it very easy to talk about issues occurred. Furthermore it looks like the have short lines of communication what helps the player to get answers quickly. There are multiple licences visible on the website of No Bonus Casino. This is good news for most players, they tend to be very responsible and fair by this (otherwise you would not have then). They offer the UK Gambling commission licence, the LGA licence (Malta) and the Curacao licence. Of you ever have an issue with this casino there’s 3 doors to knock on, 2 of them are reputable European authorities.